You may not think all that much about paying your electric bill every month. And if you do, well, that’s just the cost of doing business, right? Not exactly. Take just a moment to consider the energy you’re likely paying for that room no one in your office is using, and you’ll definitely want to find smart ways to reduce your business energy costs. The fact is, depending on the size of your organization and facilities, you can lower your electric bill by thousands of dollars every month by taking a few easy steps to increase the energy efficiency of your offices. Here’s a rundown of the specific tips and simple changes you can make that can add up to short-term and long-term energy savings for your business. Nothing gets the heart racing like the word “audit.” While this may not sound like a good thing at first, when it comes to your business energy costs and usage, it really is. Most utility companies offer free business energy audits to their commercial customers. They can help you figure out where your money is going every month, how to increase energy efficiency and where you can make adjustments to lower your electric bill. Not in use? Then turn those lights and equipment off. This one may seem pretty obvious, but you’d be surprised how much juice all those computers, monitors, printers and more consume sitting unused but left on. By making sure they’re in “sleep mode” or turned off completely overnight, you won’t be paying for electricity you’re not even using. Make it someone's nightly routine to take a quick tour of the office and flip the OFF switch on idle equipment. That goes for breakroom devices like microwaves, coffeemakers, radios and TVs, too. Make sure these energy vampires are plugged into a single powerstrip, so they can be turned off all at once on the way out the door. Take advantage of natural sunlight as often as you can. Let the sunshine in! Open the blinds around your workspaces to make the best use of daylight—and take advantage of skylights or other natural light sources to reduce your lighting needs during daytime hours. It’s also worthwhile to see if there are areas of your office that are overly lit and remove lighting that may not be necessary. Install long-lasting compact fluorescent light (CFL) or light-emitting diode (LED) bulbs. This is one place where saving a little bit in a lot of places can really add up. Replacing a single 60-watt bulb with an 18-watt energy-efficient bulb that’s on for 10 hours a day can easily save a business $1 or more each month. Multiply that out to an entire year—and by the hundreds (if not thousands) of bulbs in your business—and we’re talking some serious savings. Energy-efficient bulbs aren’t just a smart way to lower your electric bill in the short term. Their extended service life will help you save in the long-term, too. Energy Star LED light bulbs not only use at least 75% less energy, they can last 50 times longer than the average incandescent—up to 20 years. Use motion detectors and automatic dimmers that adjust to your needs. Believe it or not, lighting accounts for almost 20% of the electricity used in U.S. commercial buildings. So being just a bit smarter about when, where and how you use the lighting in your building(s) can add up to big savings. 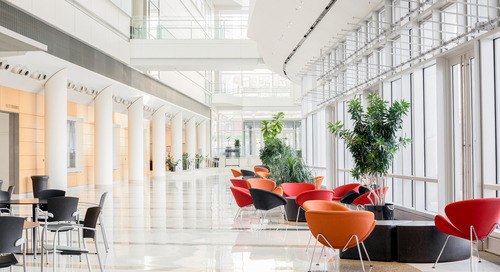 Consider installing motion detectors in hallways, meeting spaces and other places where “always-on” isn’t always needed—along with automatic dimming controllers that measure and adjust to the light levels you actually need. Install programmable thermostats, and use them wisely. A programmable thermostat gives you the power to automatically adjust the temperature of your workplace when no one’s there (e.g., most nights, weekends and holidays). Set yours to turn the AC or heat on 30 minutes before people arrive and off 30 to 60 minutes before they leave. In warmer weather months, it’s a good idea to set your thermostat no lower than 78 degrees during office hours to reduce energy use. Then, during cooler weather periods, set your thermostat no higher than 68 degrees. Fun fact: Keeping your office temperature just 1 degree cooler during winters and 1 degree warmer during summers can reduce the power you use up to 10%! Keep the heat in (or out) with screens, film and weather-stripping. While you may think the gentle breeze from your conference room window isn't a big deal, it’s really money and energy flying right out the building—and it's too easy a fix to ignore. Add or replace weather-stripping, caulk or foam around your windows and doors to save energy. Drafts aren't the only way windows can cost you energy and money. Windows let in the sun’s light and heat, which can make it more expensive to cool your office in warmer weather. Luckily, there are plenty of window treatments that can help your business cut down on heat gain and increase energy efficiency, including solar screen window shades, awnings and high-reflectivity window films. When it comes time to buy new office equipment, be sure to look for the Energy Star logo. Energy Star-labeled computers, monitors, printers, fax machines, scanners and copiers can run much more efficiently and automatically power down during extended inactivity. That gives you the chance to save 50% or more in energy use on these power-hungry devices. And if your old heater or air conditioner is not working at maximum efficiency, it could draw unnecessary power, which also costs you money. Replace those old heaters and AC units with Energy Star models. Consider alternative and renewable energy sources to help power your business. Using commercial renewable energy sources, such as solar and wind, to power some or all of your business can help lower your business energy costs over time. It also generates power that’s free of harmful CO2 emissions and other greenhouse gases. Based on a number of factors, there may never be a better time to invest in solar (or other sources of clean energy) to get the energy your business needs and pay less over the long term. Keep your HVAC systems running smoothly. Change the filters on your HVAC equipment regularly, and make sure to have the units inspected and cleaned as often as recommended. Make sure that areas in front of all vents are clear of furniture and paper. As much as 25% more energy is required to distribute air if your vents are blocked. Twenty years ago, if you had asked many business leaders: "What is energy efficiency and how does it impact your bottom line?," you probably would have gotten a lot of blank stares. We’ve come a long way since then. And while you may believe your business is already doing its part, there’s always room to increase your energy efficiency and save even more on your electric bill. Finding ways to reduce business energy costs throughout your offices—and using renewable energy sources to generate more of your power—can put your organization in a better position to compete and succeed.